The hard-hit auto industry in the U.S. is making a comeback, partly due to advances in green technologies. That could be exactly what the beleaguered sector needs, and Hilary Kramer, editor of GameChangersStocks.com says these environmentally friendly technologies could serve as catalysts for a number of stocks. 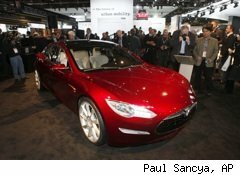 In June, electric carmaker Tesla Motors (TSLA), which made its name with its $100,000 Roadster sports car, went public. The company raised $226 million as the stock rose to $30, but shares later fell to below their offering price of $19 per share. Is Tesla a buy? You can be sure that Nissan, GM and others will quickly follow Tesla's lead with their own plug-in cars. Another green stock to watch: Johnson Controls (JCI). This company, founded in 1885, makes lead acid batteries for automobiles as well as other batteries for hybrid cars. Kramer gives her view on how the stock will perform. Finally, Kramer discusses Westport Innovations (WPRT), a company that makes engines that operate on natural gas. Kramer says that rapid transformation in the trucking fleet industry will result in increased demands for Westport's products.